The cooking challenge puts grilling skills to the test as celebrity chefs and restaurateurs, Akira Back, executive chef of Yellowtail Japanese Restaurant & Lounge at Bellagio, and Todd English, chef, Olive’s at Bellagio, battle live on-stage to create the ultimate barbecue feast. The winning team will receive $20,000, presented by Chase Sapphire Preferred to help fund the student’s culinary education and dream of becoming a world-class chef. An additional $5,000 will be presented to the runner-up. Two talented students from Le Cordon Bleu Culinary Institute in Las Vegas will be given the opportunity to participate as sous chefs during the event. Huelsman, a single father of two, questioned his ability to pursue his passion as a chef at an older age and later stage in his career. Lost, he reached out to Chef Todd English for career guidance and to his surprise Chef English responded and advised Todd to not give up and pursue his hunger to become a chef. Fast forward to today and this has come full circle as Huelsman will grill alongside Chef English and thank him in person for his inspiration and advice that changed his life. As an Islander of Guam, Merfalen is no stranger to grilling as grilled vegetables and meats are a staple at their Fiesta celebrations. Merfalen has a passion for cooking and creating and will use the winnings to attain his Associates Degree in May 2014. One year ago, Huelsman sent a letter to Todd English in hopes of receiving guidance on how to remake himself as a chef after building a career in insurance to support his two children. To his surprise, English responded and advised him to never give up and to follow his dream. Huelsman enrolled at Le Cordon Bleu Culinary Institute – inspired to make it. Bon Appétit restaurant and spirits editor, Andrew Knowlton, will serve as emcee and head judge for the event, while Robin Leach, entertainment and celebrity reporter, and a Chase Sapphire cardholder will also judge the chefs culinary creations and select the winners. 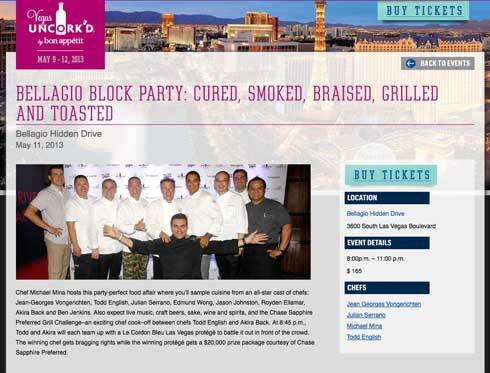 The event is part of the 7th annual Vegas Uncork’d by Bon Appetit, a week-long food, wine and spirits festival in partnership with Bellagio, Caesars Palace, Mandalay Bay, MGM Grand and Chase Sapphire Preferred. This unique culinary festival brings together famed Las Vegas resorts, celebrity chefs, master sommeliers and true food fans in celebration of the Las Vegas culinary scene and growing food community.